Discussion in 'Herp Help' started by ZoolNerd, Jun 6, 2018. I got this snake back in early April and it took a pinkie mouse the second night after bringing it home. Since then I haven't been able to get it to eat and it has only pooped once in that time. I tried braining the mouse, I tried bigger mice with fur, tried rats, tried scenting it with chicken, tried waiting a week between attempts, tried just a rats tail with the bloody end, checked temperatures and humidity, tried assist feeding; and in the end had to force feed a small pinkie mouse on the 17th of May as he's getting skinny but he still hasn't pooped since then. He does not have a visible lump in his belly but does also look like he might be going into shed soon. Any advice would be appreciated. Thank you! Sorry also forgot to mention his hot spot is around 30 degrees and the cool end is the room temp around 10 to 20 at the moment here. Try bumping the hotspot up to about 35 , wait a week and try not to disturb it at all then offer a fuzzy rat . A pinky mouse is way way to small a feed !! not recommend force feeding unless absolutely necessary . Also are you providing 24/7 heat ? Yes i realise its too small but it was the only thing it would take and trust me i know force feeding was ****ing horrible i never ever want to do it again. I have tried leaving it for a week and offering a fuzzy. I have tried offering pinkie rats as i have written up there. I have had the hot spot at 34 and left him a week between feeds (as i said). Also because I did have to force feed pbviously its going to be with something small. Will try bumping it up again and i always wait a week to offer and i leave him alone always. Yes i also have 24/7 heat. Is the enclosuretoo big perhaps? Too exposed to the outside world? Also i have left 3 feeds in there over night. He is extremely far from having an aggressive feeding response. I will try a fuzzy rat, but i really believe it will be too big and also the person who sold it to me had never fed it rats so i will try (willing to try anything obviously if i asked here) but highly doubt it will work. When you say it won’t eat, does it smell the food and not do anything or does it just not want to come out? 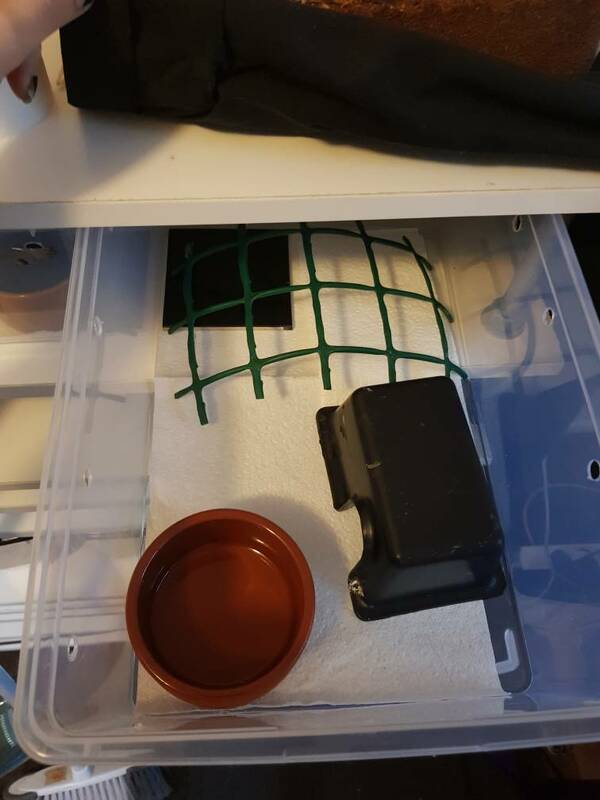 You could also add a small hide in the hot area. Thank you very much I will definitely try the fuzzy rats and have put the heat up to 34 at the moment. He smells it and starts flicking his tongue but then turns his head like "no, no, do not want" and always turns his head away from it and i have tried holding it at a few different angles, closer, farther, holding it still, jiggling it, leaving it in over night. I realise what you were referring to i addressed both. I do want new advice on stuff I haven't already tried. Yes, hence why i have kept trying with mice but also tried rats as mentioned in my original post. Thanks. Shire pythons and Bl69aze like this. A snake that size will easily take a half to 3/4 grown mouse with no problems. Most young carpets don't really like pinky mice or pinky rats, they always prefer something with fur (I always start my baby Carpets on weaner mice - they can easily swallow them, and I rarely have a problem with them not feeding first time. (I also leave the first feeding for 6-7 weeks after hatch, so they are pretty hungry). Try dropping the muse into hot tap water until thawed and warm (about 5 minutes) and offering it immediately. Generally the biggest problem with getting young Carpets to feed is too low temperatures. You are probably overthinking this and panicking, a couple of months without feeding is nothing to worry about. Force-feeding is NOT a good idea unless it's a matter of life and death, and this snake is definitely not at that stage - you risk doing more harm than good with unnecessary force-feeding - such a gross intrusion into the animal's life can make it very resistant to future feeding attempts. What's your heat source? Sub-floor is far better for young pythons, and you should have about 1/3 of the floor heated to about 32-34C. 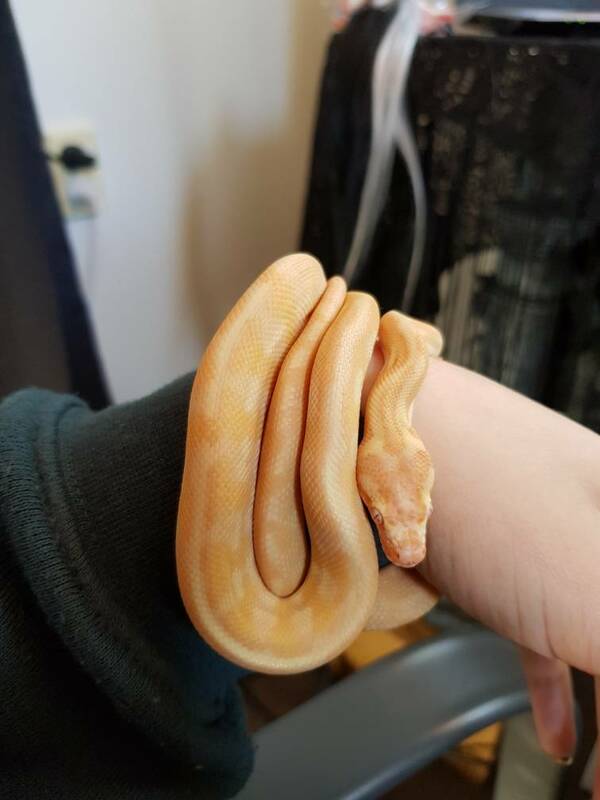 If the snake was well fed and growing when you got it, it will begin feeding when it is ready, as long as all husbandry parameters are satisfactory, especially temperature. Nero Egernia and ZoolNerd like this. A snake that size will easily take a half to 3/4 grown mouse with no problems. Most young carpets don't really like pinky mice or pinky rats, they always prefer something with fur (I always start my baby Carpets on weaner mice - they can easily swallow them, and rarely have a problem with them not feeding first time. (I also leave the first feeding for 6-7 weeks after hatch, so they are pretty hungry). Try dropping the muse into hot tap water until thawed and warm (about 5 minutes) and offering it immediately. Generally the biggest problem with getting young Carpets to feed is too low temperatures. You are probably overthinking this and panicking, a couple of months without feeding is nothing to worry about. Force-feeding is NOT a good idea unless it's a matter of life and death, and this snake is definitely not at that stage - you risk doing more harm than good with unnecessary force-feeding - such a gross intrusion into the animal's life can make it very resistant to future feeding attempts. Okay great thank you so much for that Jamie, i have been feeding it straight away and i top the hot water up near the end of thawing to make sure its properly warm but i think trying something even bigger might be the go really. I still have more fuzzy mice too so will keep trying those, or a fuzzy rat next. Thank you for your in depth advice. He is very very skinny and his bones can be felt easily but will just keep trying and i guess leaving it in there every week or so. Just another comment - there is a common belief among some that you must get them eating rats as soon as possible, going from pink mice almost straight to pink rats. Pink mice and rats are nothing more than protein mush. I always keep Carpets on mice until the snake is too big for its mouth to easily handle them. Adult mice are a far more nutritious meal than a pink or fuzzy rat - they have fully developed bones, internal organs, a digestive tract that also has nutrients that the rodent has eaten, and an amount of fur - all of which are important to a growing snake. If the photo you posted at the beginning of your thread is a recent shot, the snake doesn't look skinny to me. Yes it was just the other day, I wish i hadn't force fed but I truly thought it was very serious it had been about 4 months but I have learnt (I was extremely gentle and have done a lot of dissection work in my life so good at being precise, gentle and steady but still, never again) . Thank you for that, it makes sense, I definitely have heard the rat myth before. Thanks for your time and explanation, much appreciated. One photo isnt a great representation, I will admit he looks plumper than he is in it, when he is moving and straighter you can see and feel it. Anyway, I'm glad to know he the situation is not as dire as i thought. 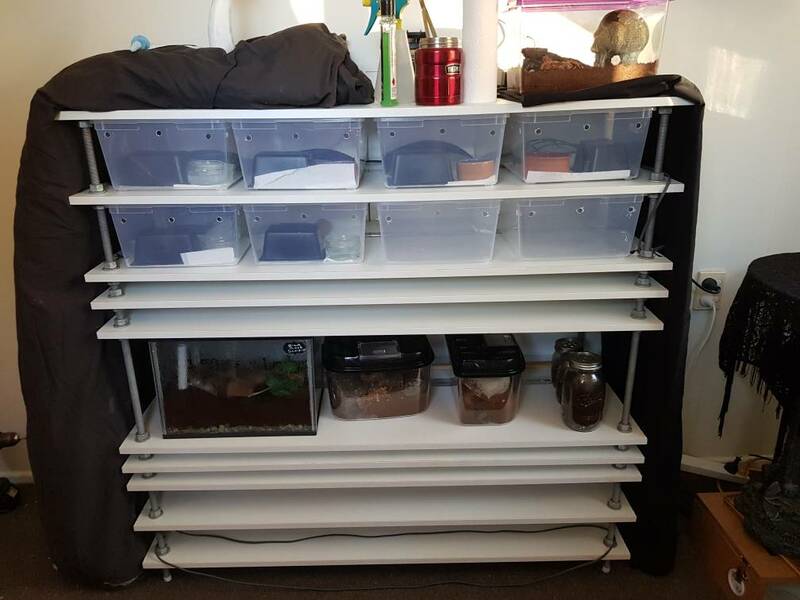 I also forgot to reply about heating before, they have heat cord routed into that rack underneath their tanks and it warms about a third of it. OK. For a tub like that I would probably have two passes of heat cord about 40mm apart, and cover them with aluminium adhesive tape (available from Jaycar in various widths, but I use 50mm wide. Don't buy the bitumen-backed guttering tape from Bunnings! ), which evenly disburses the heat over a wider area, in this case 2x50mm = 100mm. Currently I have a small setup of three tubs like yours (with the height just tall enough to allow the tub to slide out without the lid). It has two passes of 15W heat cord that go under and over (routed into the underside of the panel above), both covered with the aluminium tape, and it is maintaining a temp at the warm end of about 31-33C without a thermostat. It houses a 6 month old GTP and a similar aged Intergrade in separate tubs. I ran the cord above as well because of the GTP. The charging port on my phone won't play ball with the micro USB at the moment or I would put up some photos. Thats exactly what i have except for one pass rather than 2 as i dont have a routing thing to route another turn as yet.